Get 40% off at The Body Shop ! Home » Online Deals » Get 40% off at The Body Shop ! 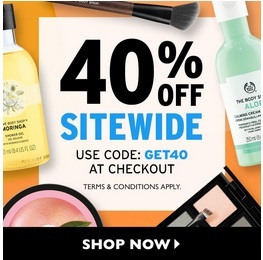 Get 40% off sitewide at The Body Shop when you use code: GET40 at the checkout. Plus get free Ground Shipping on orders of $50 or more and free Ground Shipping for Ontario residents only. Don’t forget to purchase through your Ebates account to earn an additional 8% cash back.